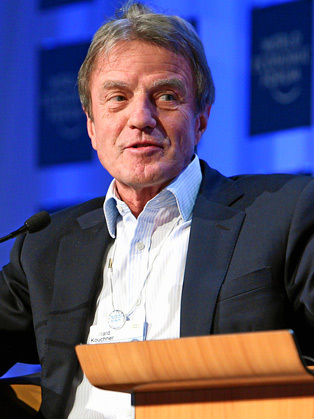 A medical doctor by training, Bernard Kouchner is best known as the co-founder and former president of Médecins Sans Frontières (Doctors Without Borders), the Nobel Peace Prize-winning humanitarian organization made up of voluntary medical personnel who contribute their time and expertise to assist in situations of emergency or inadequate medical care in the developing world. In 1988, he ran for a seat in the French parliament from Valenciennes, but lost. Instead, French President François Mitterand appointed him to serve as Minister of State with the Ministry of Social Affairs and Employment, a cabinet department. There, Kouchner was responsible for social integration, and also took a second post, attached to the office of the Prime Minister and with responsibility for humanitarian action, that same year. In 1991, he moved over to the Ministry of Foreign Affairs, again holding a post that made him the country's humanitarian-action watchdog. Kouchner continued to serve in the French cabinet, in March of 1993 taking a post as Minister of Health and Humanitarian Action. Bernard Kouchner continues to promote universal access to medical care and to take part in international efforts in the fight against AIDS. In his unique keynotes, he shares what happens behind the scenes and what he feels can be done for a better future.